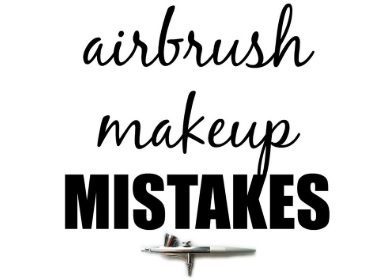 The top 5 most common airbrush makeup mistakes are presented. In the world of airbrush makeup, it all seems quite easy. Take the airbrush gun, point in into the face or skin, press a button and it’s done. Still, there is a lot beneath the flawless finish especially if you are a total beginner. Mistakes can sneak into your beauty routine and make a mess out of everything. Therefore, before you start applying take the time to read the most common mistakes which can easily occur when using airbrush makeup. When going into war you must be prepared, you must know your strategy and your gun. The comparison is a bit excessive but true. You must get to know your equipment: where the pressure comes from and how to control the amount. The advice is to start from the lowest mode and slowly move up towards higher ones. Avoid being clumsy, learn how to use the lever. Avoid uneven application and remember not to move the airbrush in back and forth motion. On the top part of the airbrush gun, there is a small trigger. He is in charge of flow control of the foundation and the makeup. Basically, he is the boss. You have to control the boss, so you won’t make a mess out of your face. Pulling the lever completely backwards is wrong. It won’t speed up the process, it will just blast the makeup onto the skin and all you get is uneven coverage. When holding an airbrush you should ensure a proper distance from the face. The advisable distance which will do wonders is four to six inches away. This is how the professionals do it and a flawless finish is guaranteed. In addition, if you are covering a blemish, you should focus on that particular area and move the airbrush one inch away from the face. The makeup is there to make you look and feel beautiful. Remember that airbrushing is made for a subtle application with a natural young look. To avoid wrongful application, first make a thin layer and apply it on skin areas that need more coverage (any type of skin flaws). First off all, you must know your skin type. The skin type determines the makeup you will be using. If you use for example a silicone based makeup (which is not water-soluble) this can allow the foundation to slip off. This causes you to use even more foundation which will just pile up and no lost long. When determining the color you will be using, you should first test it along the jaw or neckline. Choosing the wrong color will lead to unmatched color shades on your face and neck or body. You must choose the color which will perfectly level your body color. Now, you are ready to go! Choose your airbrush makeup kit (if you don’t have one already) and start applying makeup. Check out also the top 10 airbrush problems and solutions.